This is a tough time of the year for me. 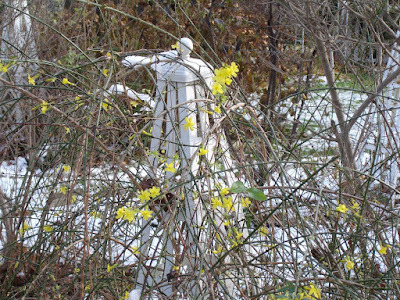 We’ve had our first snowfall and hard frost, so there’s not much left in my garden—just a little bit of winter jasmine. I try to have something in bloom for as much of the year as possible but December and January are tough. I usually get a snow drop or two in January, but that’s it. Friends who know of my passion for gardening sometimes ask if I’ve ever wanted to move to a warmer climate where I could have an all year round garden. Not an option. Not only do I love my city, my house, my friends, I don’t think I could live without the drama of Summer, Fall, Winter, Spring. I’m sure that I would never burst into tears of joy at the sight of the first species crocus (usually in late February) if it weren’t for several months of ice and cold. Now maybe that sounds a little crazy—wanting the pain of winter to fully experience the joy of Spring, but that’s how it works for me. And then Philly winters aren’t all that bad; it’s not like I’m living in Maine. And the Holidays for me are a Winter Solstice festival. I just can’t imagine the holiday season without cold weather and at least the possibility of snow. The way I make sense of the world is bound up with seasonal change. Sure some of it may seem clichéd—e.g., the autumn of my life—but it’s powerful nonetheless. Holidays once I left Chicago for Northern California and now the desert Southwest just aren't the same... they sneak up on you while you're still wearing shorts. I’ll take seasonal change over endless sunny days, but all that sun shine must be wonderful!